maybe i need to make a major overhaul of the map so that more people will comment? Don't be so impatient. People come here on their free time and comment when they can, you can't expect to get tons of comments after every post. Sometimes you can go days without comments. My advice is, if you don't get comments for a while, make some change to the map. People will either like or dislike the change, but either way it is likely to get you more feedback. Mapmaking requires tons of patience. Just keep on working on your map, listen to feedback when you get it, and eventually it'll all work out. right now what im doing is looking at other maps and seeing what makes them so good, so far i am looking at the western front map and the fonts are quite good so i experimented on my map having a colour behind the text and shadows. -i dont think i will change the ho chi minh trail much as the trail was not actually a marked path or road it was just regular jungle landscape that they went through simply outside of the border of the country so i personally think it makes more sense to look like a landmass then a route 66 type road. 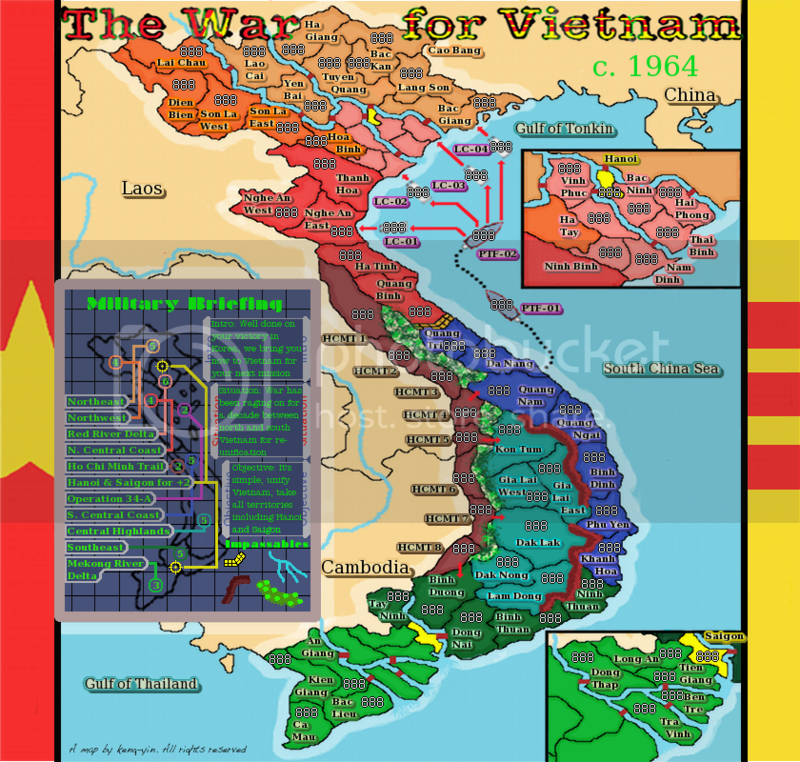 Re: Vietnam war map - does this map have potential? kengyin...yes i think this does have potential, and i like the concept behind the design, even thought some of the colours simply need tweaking, but that will happen by the end process. As natty pointed out, your size is an issue. I have a golden rule for mapmaking that has served me really well. Develop your map as the small size (630 x 600) first to ensure that everything (army shadows if you want them or numbers plus names in whatever font) will fit adequately. The map has potential, but I must protest against the choices. Saying that a map will stall out somewhere is A: really pessimistic, and B: neglectful of the fact that each map is constantly improving through each stage. There is no predictor of when something will stall out, if it does at all. As for the map itself, it's got way too much text on it. The briefing is a good touch, but it's a wall of text that doesn't add very much in return. Cut it down to the bare basics or perhaps reword it to something shorter. i like the map man, I know the time you have put into this. Vietnam is a special country. I miss it. this map would reflect this. The vietnam war was a slaughter on proportions noone really knows.... The tet offensive was literally a horror house... America killed the enemy at a scale never recorded before.. and NV lost people with a fervor never seen before. 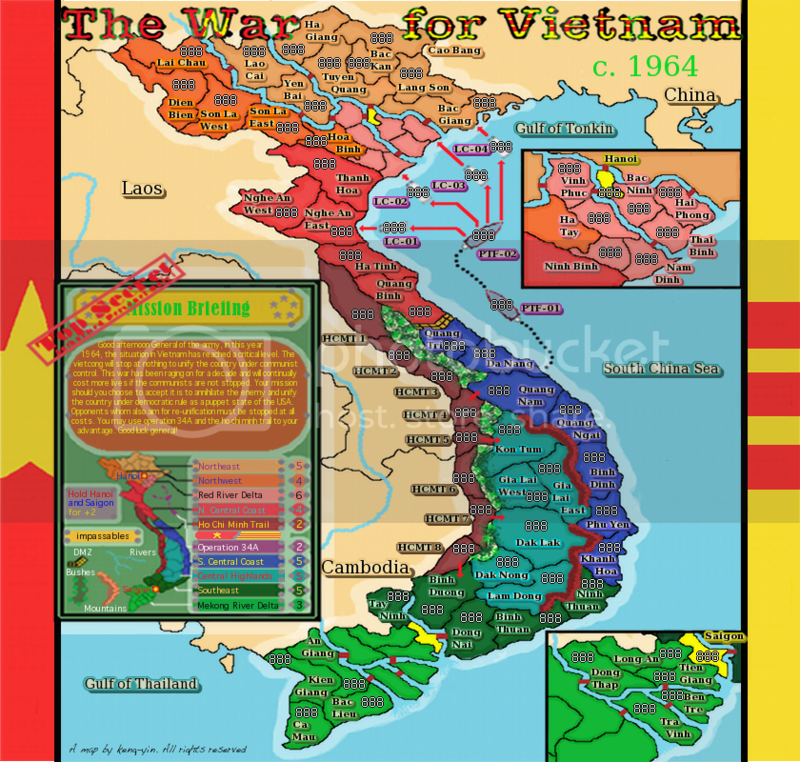 I have received a classical unbiased education on this.. and I love the map, just not sure if it does the war credit. I know this map needs a lot of work yet, but doesn't it meet the qualifications to move on to Gameplay? new legend, i went for the computerised look, kind of like those screens where you put your mouse over a tab and then the text comes out. I like the new legend as well. However, the text will not be very easy to read on the small version. I suggested before that all you need to do is, expand the legend out to the edge of the map. You can also make it a little bit taller too. Also, I love what you have done with the colors. It kinda reminds me of the silk jackets with the brightly colored embroidery that was made in Nam during the war. See if you can google it or something. You will see what I mean, and maybe you might get a cool idea or two. This map is progressing pretty well and its come a long way, but I do have some issues to throw out there. 1) The whole land invasion of North Vietnam is not correct. The USA never made the massive land invasion that you're depicting here. What I suggest is maybe keeping one boat heading north (to keep the flow of the map) and then throw in an air power option. Put some carriers in the South China Sea that can be attacked by bases in S Vietnam. The carriers can bombard North Vietnam. Do this and I will give you my utmost support to see this map quenched. Nothing bothers me more than inaccurate historical maps, and the land invasion from the south is the only major point. 2) You need a small map. This is important because you need to know as soon as possible whether or not everything will fit on the small map. Listen to IH. He knows what it takes. 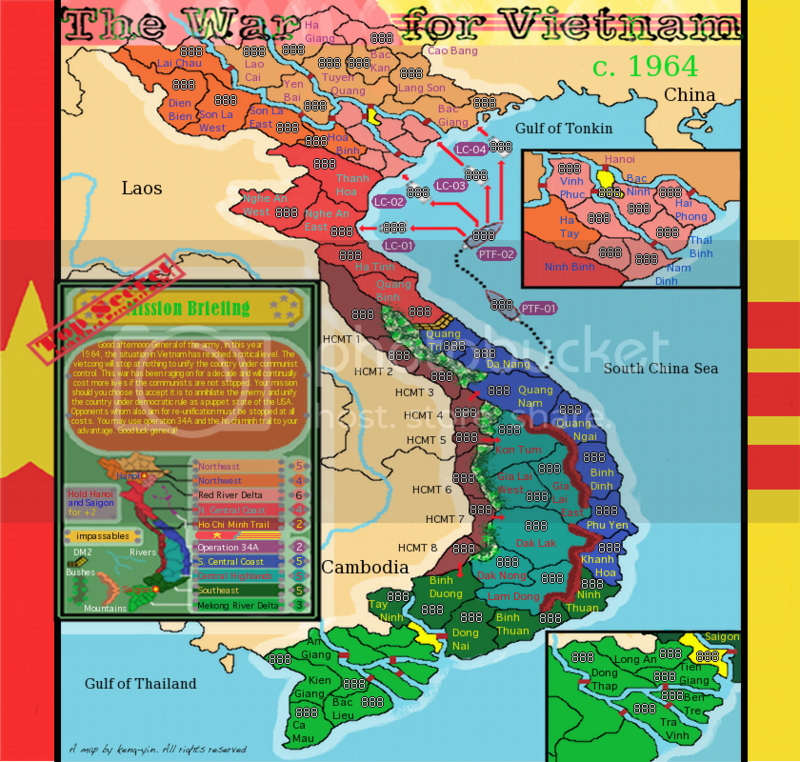 I would also work on the bonus color flow some more and make Ho Chi Minh trail a trail.. Not a land mass. As for your current poll. Do away with that. Gameplay and graphics will be worked on in their proper forums. All you really need to know is if peeps are interested and they sure appear to be. Just do what IH sugg'd (small map) and you'll move forward. Industrial Helix wrote: This map is progressing pretty well and its come a long way, but I do have some issues to throw out there. if the carriers only bombard then does that mean there is only one assault point via the one boat onto north vietnam? That's what I'm thinking. The strength of the USA wasn't in land invasions during the war, it was my bombing the hell out of North Vietnam. I imagine that people will be able to make a dive for North Vietnam via the boat if they have to, thus keeping the flow of the map. Perhaps the boat can have an entrance point in the north or the south of N. Vietnam, so two entrance points making it difficult to block up by any player wishing to secure the whole of North Vietnam, and make the boat itself a killer neutral, like 2. After that, maybe raise the value of the bonuses in N.V. so as to encourage players to grab them despite US airattacks. Don't you think it's about time you make a design brief? The Bison King wrote: Don't you think it's about time you make a design brief? Small map is required first. I only had a large version when Pachisi went to Gameplay.